Product prices and availability are accurate as of 2019-04-22 10:25:01 EDT and are subject to change. Any price and availability information displayed on http://www.amazon.com/ at the time of purchase will apply to the purchase of this product. 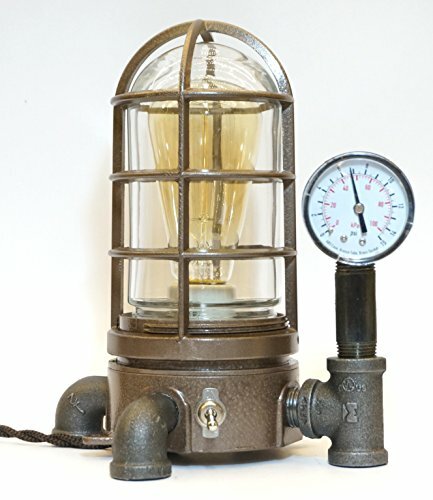 Jules Verne styled industrial light will add to the conversation at your next get together, add intrigue to your office desk or create a unique machine age atmosphere in your home. Constructed of new and reclaimed materials. Handcrafted, no two items are the same. Styled after explosion and vapor resistant fixtures, not intended for industrial use. Industrial Pipe and Pipe fittings used as accents to the unique design. 2 inch air pressure gauge. 6 foot antique style Brown and Black twisted cloth cord. Antiqued surfaces, the pictures do not capture the intricacy of the iridescent surface. All new UL approved electrical components. 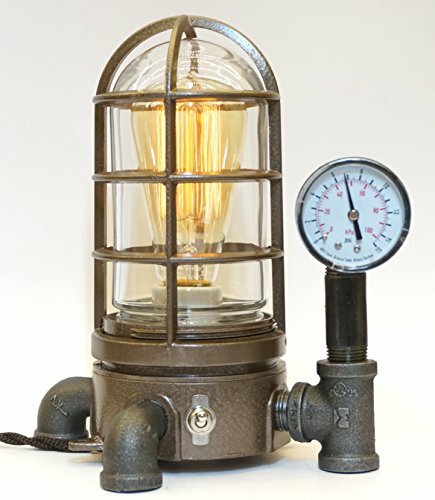 Includes a 40 watt edison style bulb. Adjustable, plastic feet insure the lamp will not damage furniture.